Do I have to send a thank-you note? Q: Should I send a thank-you note after an informational interview? I met with one of my father’s graduate school classmates. We met for coffee at a local coffee shop. He gave the once-over to my resume and gave me tips. It did not lead to an internship or a summer job though. If I did send him a thank-you note, what should I be thanking him for? The review of my resume? Sometimes I feel like some of these quote informational interviews are a waste of time. A: We are an impatient species! We would all like to invest time and have it result in a meaningful and quick outcome. Sometimes the world doesn’t work that way. I wish it did! When you meet with someone for networking purposes, I consider it in an investment in the future. It may be 10 days from that meeting, or 10 years from that meeting. You are also meeting with all of their contacts. Specifically, if you leave that person with a good impression, it is likely that he or she will think of you if they hear of a suitable opportunity. Yes, send a thank-you note. Email might be the best vehicle for sending a thank-you note. Be gracious and authentic. Not all informational interviews result in an internship or summer job. However, suppose that contact meets with another colleague later that week. And he learns of an internship that would be ideal for you. 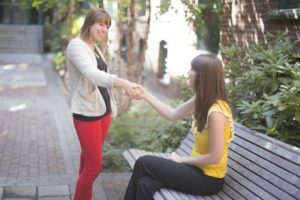 If you left a positive impression (including a thank-you email), he might connect you with that colleague. Or he may think of you when you graduate, and his company hires recent graduates. If I invest an hour or so meeting with a networking contact (at their request), I expect a thank-you note. It doesn’t have to be lengthy or a significant investment of the person’s time. I can thank my mother for encouraging her children to send thank-you notes.